Nanotechnology has been around as a recognized branch of science for only about fifty years, so it’s a baby compared to physics or biology. If you remember high school science, you know something about atoms, so that can be our starting point in explaining the evolution of nanotechnology. Simple model for the structure of an atom. 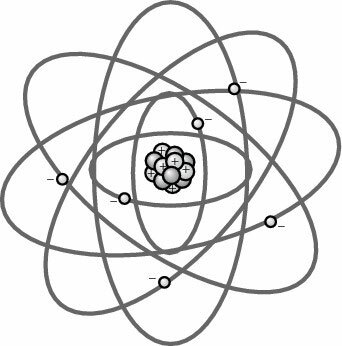 The word atom comes from the Greek word for indivisible, atomos. The atomic bomb demonstrated that atoms can indeed be split, but way back in 450 B.C. they were blissfully unaware of such possibilities. In 1803 John Dalton discovered that elements such as water are actually collections of atoms. These collections, called molecules, have different characteristics from the separate atoms (think of two hydrogen atoms combining with one oxygen atom and the wet result of H2O). Today we recognize that some of Dalton’s original theory of the atom doesn’t hold water. Still, the most important concepts, that chemical reactions involve the joining and separating of atoms and that atoms have unique properties, are the basis of today’s physical science. The idea that atoms combine to form molecules such as water is key to chemistry, biology, and nanotechnology. The work of Dalton and many other scientists has allowed chemists to develop useful materials, such as plastics, as well as destructive materials, such as explosives. All bulk materials are made up of atoms, so it was necessary to first understand atoms to learn how to make new materials. Scientists could draw conclusions about atoms based on the properties of the materials they produced, even though they couldn’t see inside an atom. An important point to underscore is that nobody has ever seen the structure of an atom. Even today’s most sophisticated microscopes don’t reveal the details of atoms, just fuzzy pictures of tiny orbs. All the information about the structure of atoms is based on empirical evidence. Scientists determined that each type of atom absorbed different frequencies of light and then used those differences to make a model of the structure of electrons around the nucleus of each atom. Other scientists bombarded atoms with very small high-energy particles and analyzed what type of particles resulted from collisions with the atomic nucleus to guess at what was inside the nucleus of each type of atom. Then scientists did the math and developed a model of each atom to match their results. The way we describe atoms to our high school students today continues to evolve as physicists probe atoms with higher and higher energy particles to provide more details about the components of the atomic nucleus. 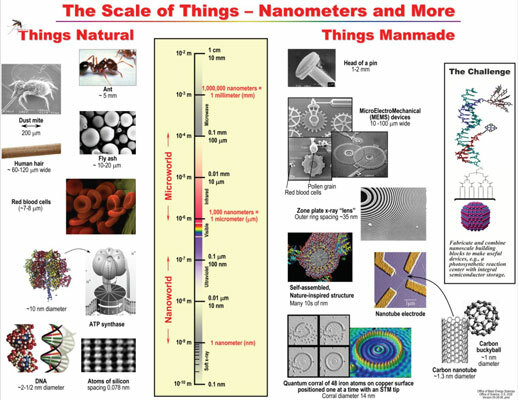 So how does all this information about atoms relate to nanotechnology? Nanoparticles (particles whose diameter, width, or length is between 1 nanometer and 100 nanometers) are bigger than atoms and, like atoms, are around us every day. They are given off by candle flames, wood fires, diesel engines, laser printers, vacuum cleaners, and many other sources. Scientists worked with nanoparticles for centuries before these particles had a name. But unlike atoms — and this is a big difference — we can now see the structure of nanoparticles. This breakthrough came a few decades ago with the advent of electron microscopes. Structure of some key nanoparticles (such as the DNA molecule in the bottom left) and their size in relation to other materials. With our understanding of atomic theory and the ability to see things at the nanoscale, we now have knowledge in place that allows us to manipulate matter in ways never before possible.